Prayer- - 1920, Color Woodcut with unique inking. Rubenstein 32. Edition not stated. Signed in pencil. Numbered 2 in the bottom left sheet corner. Image size 8 15/16 x 2 3/4 inches (227 x 70 mm); sheet size 9 1/4 to 6 3/4 inches (235 x 171 mm). A fine impression with fresh colors, on tissue-thin cream laid Japan; apparently the full sheet, with narrow margins top and bottom (1/8 inch), wide margins left and right (2 1/4 inches). Several invisibly repaired tears in the top sheet edge, two extending into the image; otherwise in good condition. Scarce. Another impression of this work was reproduced on the exhibition catalog cover Max Weber: Prints and Color Variations, Daryl R. Rubenstein, National Collection of Fine Arts, Smithsonian Institution, Washington, D.C., 1980. 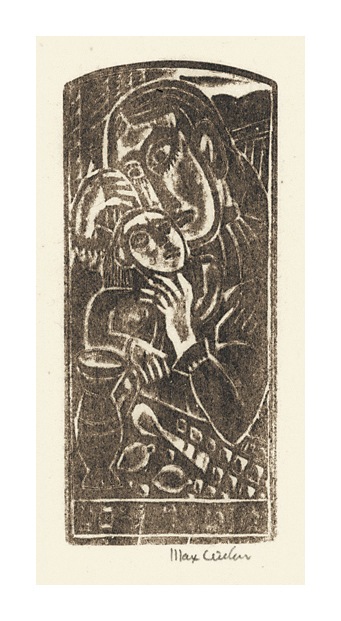 Mother Love (Madonna and Child)- - 1920, Woodcut. Rubenstein 35. Edition not stated. Signed in pencil. Image size 4 13/16 x 2 1/8 inches (122 x 54 mm); sheet size 10 x 6 1/4 inches (254 x 159 mm). A fine impression, on cream Japan, with full margins (1 3/4 to 3 inches). Brown paper tape hinge remains on the top sheet edge, verso, otherwise in excellent condition.